BaxterSports Camps started a decade ago with our award-winning soccer summer camp and now BaxterSports is a Portland institution. For the past ten years, this camp has been the top camp in the city for aspiring young soccer players. Our coaches work with young players ages 5 to 13 on all aspects of our favorite sport, from fundamental positions to advanced footwork. We train our campers to be well-rounded, positive athletes and supportive teammates. This camp introduces new skills at all levels and allows students to progress from one year to the next. We look forward to seeing kids years after year as they grow stronger and more advanced, but never lose the idea that playing soccer is something we always do for fun! All skills and experience levels are welcome in our Soccer Camp. Players can attend for a day or a week or multiple weeks each Summer. Our daily schedule includes drills, scrimmages, and full games. Players try different positions and learn to get along with different teammates. It is especially important that BaxterSports campers learn that there is more to soccer than Game Time. Our key focus is on sportsmanship and the whole athlete, from technical skills to nutrition to teamwork to proper stretching. When your daughter or son arrives at BaxterSports Camps, the first thing they will notice is that our coaches love to what they do and they love working with our campers. We are excited to meet new players and to see how return players have advanced. We work in small groups to improve fundamental soccer skills through drill and repetition, fun contests, and group challenges. Our young athletes have the opportunity to learn basic dribbling, passing, and shooting skills, and then progress appropriately to advanced techniques for penalty kicks, or slide-tackles, or goal-keeping. We introduce our players to skills specific to the various positions on the field and the offensive and defensive responsibilities of each one. BaxterSports soccer camp gives kids the chance to develop as individual players as well as members of a team. Each day, we have time for full soccer games between well-matched teams and each week, our players compete in Camp mini-tournaments. Everyone gets to play and participate in the team effort. Each young athlete can try different positions and discover different strengths in a live-game setting. Players importantly learn that having fun and being a good sport is not about being the star or the highest-scoring player, but about working together to accomplish the team goal. Our Core Values at BaxterSports are our love of playing sports, our commitment to our team and our Portland community, and our belief that having fun and living a healthy life makes us successful athletes. We build these values into every Camp program, but find these to be especially important lessons to teach in our Youth Soccer Camp. We treat stretching, nutrition, Sport Psychology, and respect with as much importance as we do passing, dribbling, and scoring. 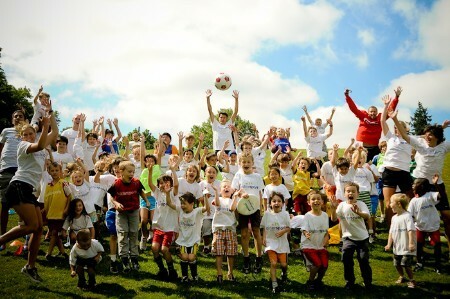 Our Soccer Camp provides a proven-successful balance of structure and freedom. Even serious training and technical maneuvers are taught as part of a fun, healthy day outside. We foster a strong sense of community between teammates, between players and coaches, and between kids, parents, and other members of our Portland community. We encourage our players to take our lessons home about healthy eating, respectful communication, and positivity. At the end of the day, BaxterSports Summer Soccer Camp is successful because our players become better sports, more positive players, and happier kids overall.